Air and Calder Rivers navigable Bill. L. Mohun, Counsel, Copy of Indictment, and Orders for Witnesses. Address for the Bp. of Derry, the Serjeant at Arms of the House of Lords in Ireland, & al. to be sent for, in Custody. Comes Pembroke, Custos Privati Sigilli. Comes Lindsey, Ds. Magnus Camerarius. 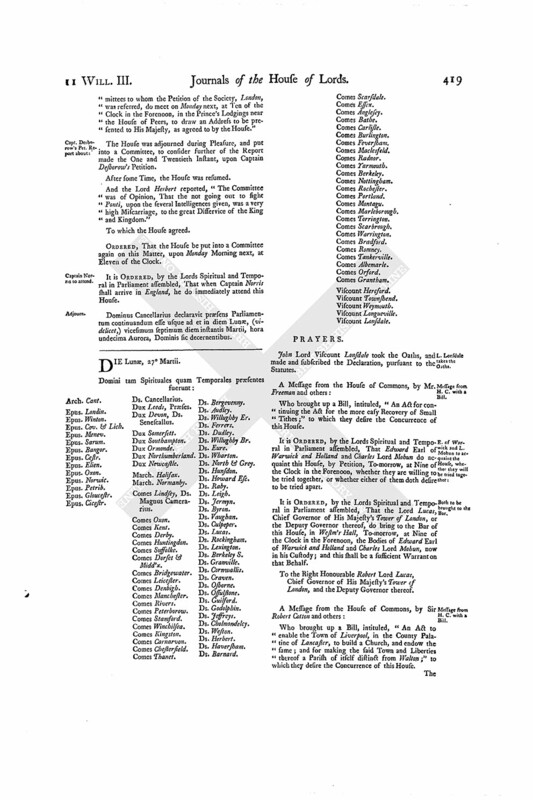 Hodie 2a vice lecta est Billa, intituled, "An Act to enable William Wrayford Gentleman and Dame Anne Rich Widow to make Leases of Houses and Ground in Covent Garden, late the Estate of John Athy Citizen and Haberdasher of London." Their Lordships, or any Five of them; to meet on Saturday the Eighth Day of April next, at Ten of the Clock in the Forenoon, in the Prince's Lodgings near the House of Peers; and to adjourn as they please. Hodie 1a vice lecta est Billa, intituled, "An Act for opening the ancient, and making any new, Roynes and Watercourses, in and near Sedgmore, in the County of Somerset, for rendering the said Moor more healthful and profitable to the Inhabitants." Hodie 1a vice lecta est Billa, intituled, "An Act for Sale of the Estate of Dudley Vesey, in Hintlesham, in the County of Suffolke, for the Payment of his Debts." Hodie 2a vice lecta est Billa, intituled, "An Act for the making and keeping navigable the Rivers of Air and Calder, in the County of York." Their Lordships, or any Five of them; to meet on Thursday next, at Ten of the Clock in the Forenoon, in the Prince's Lodgings near the House of Peers; and to adjourn as they please. It is ORDERED, by the Lords Spiritual and Temporal in Parliament assembled, That the said Elizabeth Thorold, John Lee and Mary his Wife, may have a Copy of the said Appeal; and do put in their Answer thereunto, in Writing, on Saturday the Eighth Day of April next, at Ten of the Clock in the Forenoon. Upon reading the Petition of Charles Lord Mohun; praying, "That he may be allowed Counsel at his Trial, a Copy of the Indictment against him, and Orders for Witnesses:"
It is ORDERED, by the Lords Spiritual and Temporal in Parliament assembled, That William Atwood Esquire shall be, and he is hereby, assigned Counsel for the Lord Mohun, at his Trial; and also that he have a Copy of the Indictment against him, and Orders for Witnesses, as desired. Hodie 3a vice lecta est Billa, intituled, "An Act for vesting the Real Estate late of Thomas Lascells Esquire in Trustees, to be sold, for Payment of his Debts." 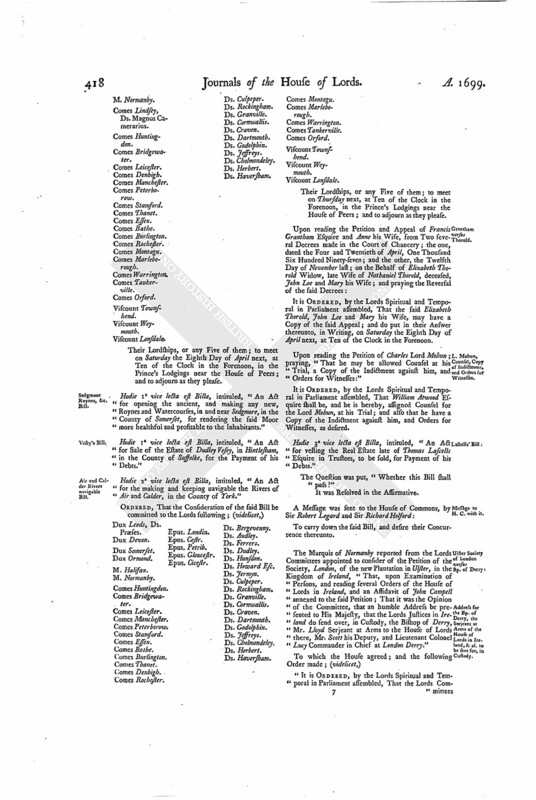 The Marquis of Normanby reported from the Lords Committees appointed to consider of the Petition of the Society, London, of the new Plantation in Ulster, in the Kingdom of Ireland, "That, upon Examination of Persons, and reading several Orders of the House of Lords in Ireland, and an Affidavit of John Campell annexed to the said Petition; That it was the Opinion of the Committee, that an humble Address be presented to His Majesty, that the Lords Justices in Ireland do send over, in Custody, the Bishop of Derry, Mr. Lloyd Serjeant at Arms to the House of Lords there, Mr. Scott his Deputy, and Lieutenant Colonel Lucy Commander in Chief at London Derry." 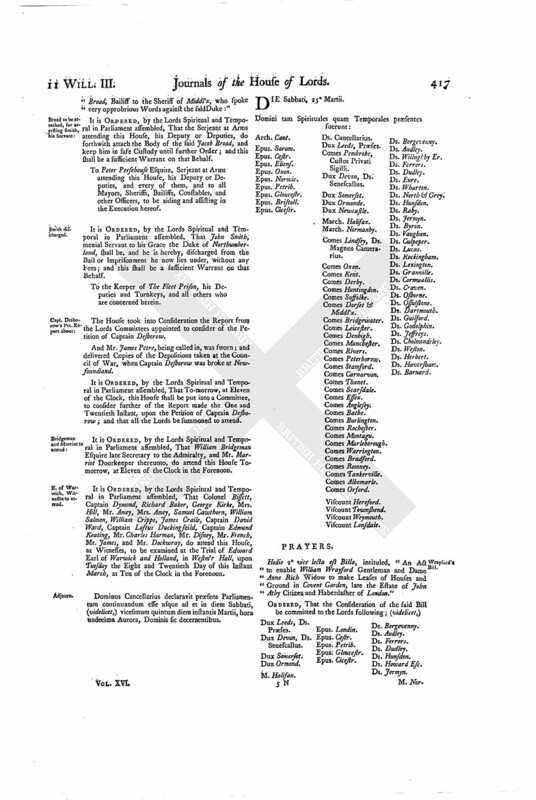 "It is ORDERED, by the Lords Spiritual and Temporal in Parliament assembled, That the Lords Committees to whom the Petition of the Society, London, was referred, do meet on Monday next, at Ten of the Clock in the Forenoon, in the Prince's Lodgings near the House of Peers, to draw an Address to be presented to His Majesty, as agreed to by the House." The House was adjourned during Pleasure, and put into a Committee, to consider further of the Report made the One and Twentieth Instant, upon Captain Desborow's Petition. And the Lord Herbert reported, "The Committee was of Opinion, That the not going out to fight Ponti, upon the several Intelligences given, was a very high Miscarriage, to the great Disservice of the King and Kingdom." ORDERED, That the House be put into a Committee again on this Matter, upon Monday Morning next, at Eleven of the Clock. It is ORDERED, by the Lords Spiritual and Temporal in Parliament assembled, That when Captain Norris shall arrive in England, he do immediately attend this House. Dominus Cancellarius declaravit præsens Parliamentum continuandum esse usque ad et in diem Lunæ, (videlicet,) vicesimum septimum diem instantis Martii, hora undecima Aurora, Dominis sic decernentibus.